One thing is for sure, the leaks are not stopping. 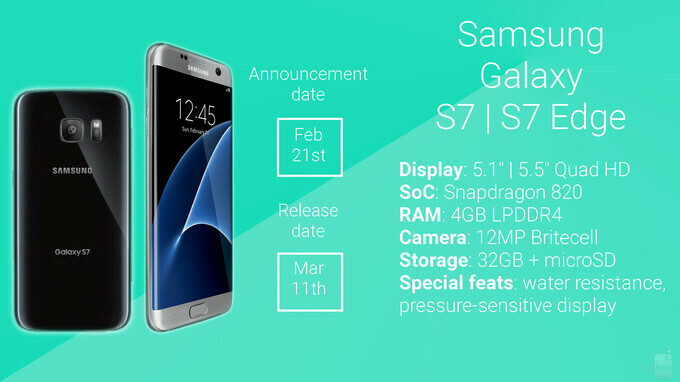 Merely two days before Samsung "unpacks" the Galaxy S7 and S7 edge before the hungry eyes of the world. A large number of specs and features got seemingly confirmed as a result of this profound leaking, with the microSD card slot and microUSB port being some of the more recent ones. Now, we've seen a fair share of device leaks, but one thing that has hardly made the rounds until now were the two top-end Samsung phones snapped next to each other. Wait, did just happen? It did! We finally get to compare the Galaxy S7 and the S7 edge and check out how they fare against one another. 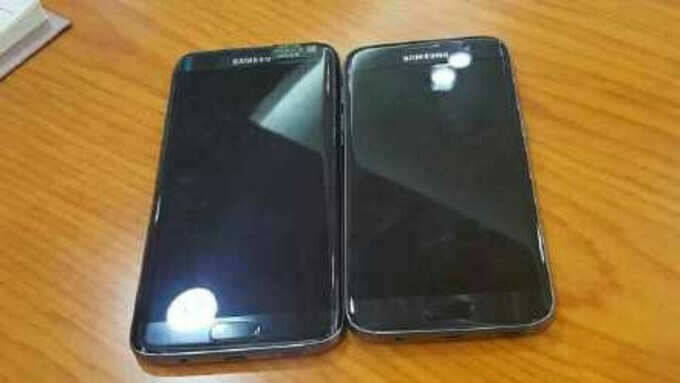 This recent leak seemingly confirms that the S7 edge will be the bigger one around. We've heard that the S7 might don a 5.1" display and the S7 edge a 5.5" one, and while we can't say if this is true due to the lack of anything to act as a scale, of sorts, there's a fairly high chance that we are looking with devices with such screen sizes. It's impossible to say whether the differences is 0.4", but it is fairly obvious that the S7 edge is the bigger one around. To catch up on all the latest S7 & S7 edge rumors, check out our rumor review right below. Feb 17, 2016, 2:59 AM, by Peter K.
Also, feel free to check out an operational S7 right below. so S6 edge is probably the 1st and last 5.1 inch variant? The a7 edge is not that big next to the s7 and a 5.5" screen is just way bigger than 5.1"
Why not wish for 100%? I doubt that there would be much phone left to hold even. Honestly, I really like Samsung's compromise on the bezels. Samsung has hit the sweet spot here in my view - not too thick but not too thin either. I hope Apple follows Samsung in this regard. The back is ugly, but the front looks nice. I see the back of my phone probably once a month. What's the big deal? Because everyone else will see the back and think you are a gross, tasteless person who chooses your electronic devices for reasons other than fashion and style. They might think you're some geek who picks your phone based on the specs or something stupid like that! since they mention micro sd as a feature (which was available already in s1) i wonder why they dont outline some of the other features: on/off button, sim card slot, 3,5mm headphone jack, ... Wow, just wow! In 2016! It's because it was left off from the S6 and Note 5 series. Having it on the device again is awesome. Kept the best from last generation [design, screen to body ratio, over all look]and added to it. Water proofing, micro sd, etc. But I guess that's all just same old same old to you. Haha you get 'awesomed' pretty easy. Lets hope volume button(s) come along, too. If rumors comes true, there are pretty many reasons to get excited. Now you tell me which other phone in the market right now gives Water resistance, nearly best screen to body ratio, sdcard and ufs both, a good battery life, best screen, best camera?? That is why we all are feeling awesome, not beacause of just return of sdcard slot, lock button and volume buttons. That headphone jack is an important one to point out...especially since the iPhone 7 won't include one muahaha! well it features a sd slot so yes i guess its considered a feature....one that's been reintroduced after being omitted from the s6/edge/note5 models, and it was the biggest single drawback with the above mentioned models so you can bet that it will get some attention to reassure prospective buyers who avoided the previous gen devices to buy this model. As usual Sammy I'll wait till November for the note 6 or s7+!